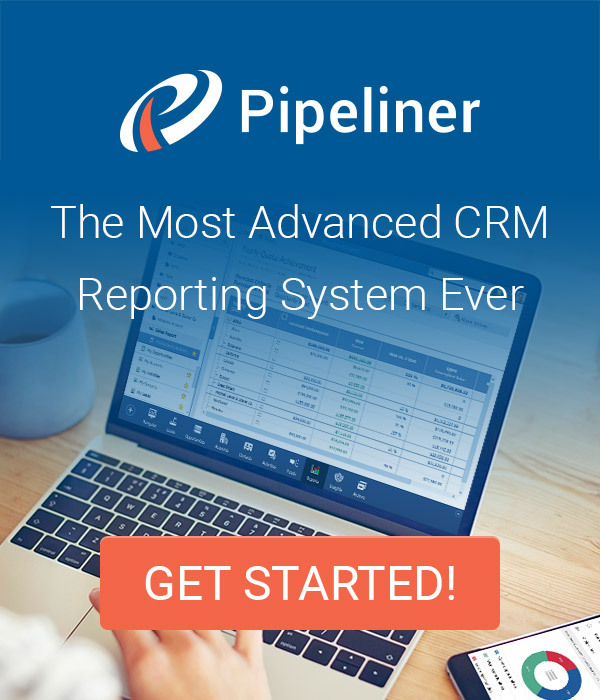 The Importance of a Sales Process: Pipeliner Sales Process Survey by John Golden - SalesPOP! Expert opinion on the subject of sales processes has pendulum swung a great deal over the years. One day sales processes are all-important and sales organizations must stick to them like glue. The next day the sales process is far less important than allowing a salesperson the freedom to take actions as they see fit. 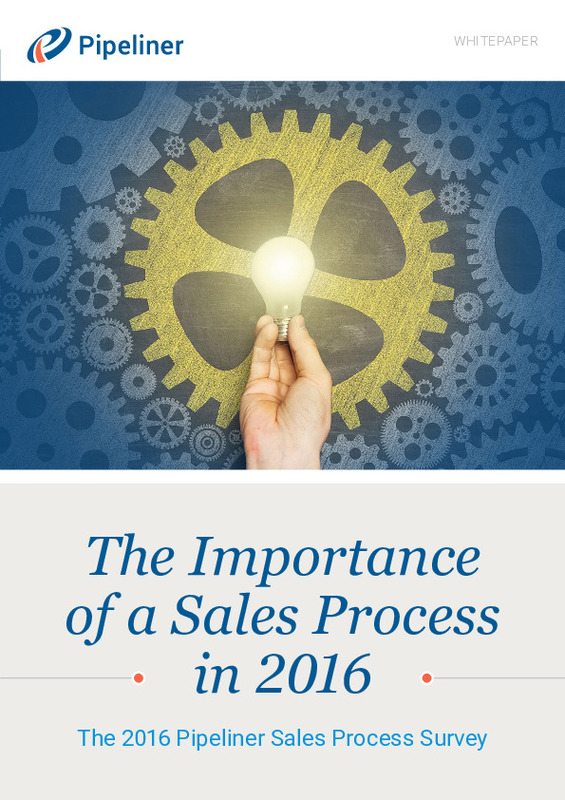 Skip ahead in time, and we’re right back to hewing as closely as possible to the sales process. 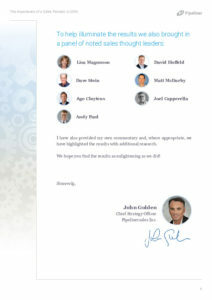 Our opinion has never varied: We have always seen the sales process as the backbone of any sales operation. It has been our experience—and the collective sales experience of our staff, which is considerable—that sales aren’t consistently made without one. But we decided to find out what’s actually happening out there in the business world. Hence we polled a healthy cross section consisting of hundreds of salespeople, sales managers and sales leaders regarding sales process importance, and how sales processes are being used in their companies. 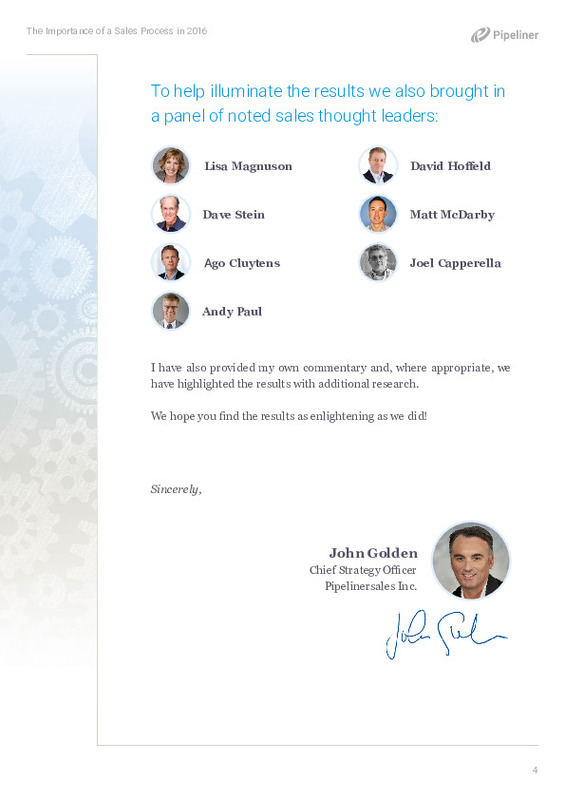 To help illuminate the results we also brought in a panel of noted sales thought leaders: Lisa Magnuson, Dave Stein, Ago Cluytens, Andy Paul, David Hoffeld, Matt McDarby and Joel Capperella. Pipeliner Chief Strategy Officer John Golden has also provided his own commentary and, where appropriate, we have highlighted the results with additional research. Question 1: Does your company have a formal sales process? According to many authorities, having and using a formal sales process is mandatory in today’s lightning-fast, incredibly competitive business environment. A mapped out process, consisting of sales best practices for a company, assures a higher degree of sales success with every opportunity. Expert Ago Cluytens, Practice Director for RAIN Group, weighs in on this question. Question 2: Do you think having a formal sales process is important? While over the years opinions have varied on this question, today they rarely do. And for a “ground level” look, have a gander at these numbers: an overwhelming number of respondents say that having a sales process is “Very Important.” That is extremely significant, and shows that a formal sales practice as a best practice is considered critical. Corporate strategic sales expert Lisa Magnuson provides her insight on this question. 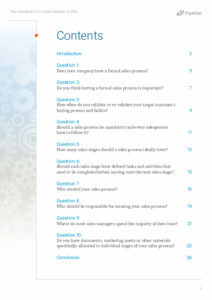 Question 3: How often do you validate or re-validate your target customer’s buying process and habits? This is a significant question and series of answers because today we most definitely live in the age of the buyer. It is easier than ever for buyers to obtain independent information on products and services. Hence you need to fully understand where your buyers are turning for data and make sure your company is presenting data along those channels. Question 4: Should a sales process be mandatory and every salesperson have to follow it? The numbers surely speak for themselves here: An overwhelming number of respondents maintain that a sales process should definitely be mandatory, and salespeople should have to follow it. Experts tend to agree. 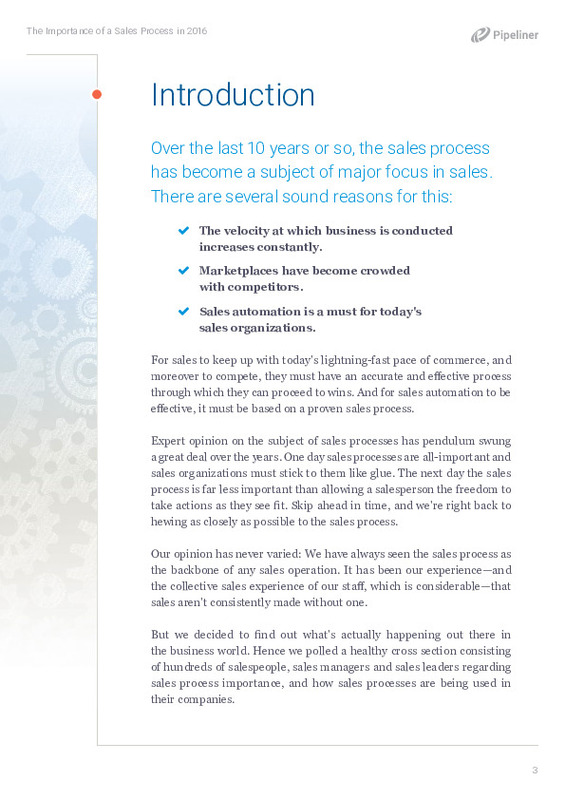 Question 5: How many sales stages should a sales process ideally have? The majority answer to this one seems to match up with a broad opinion on the subject. Question 6: Should each sales stage have defined tasks and activities that need to be completed before moving onto the next sales stage? The top answer to this one was interesting: “Yes, but only the most important should be mandatory.” That shows that there should be defined tasks and activities that need to be completed before the opportunity is moved along the pipeline. Leading sales expert and author Andy Paul provides insight to this question. Question 7: Who created your sales process? No one tracks and knows sales best practices like sales management. It therefore comes as no surprise that the majority of our respondents state that sales management are the ones that created their company’s sales process. But the next question demonstrates if this is the ideal scenario. Question 8: Who should be responsible for creating your sales process? In the last couple of years there has been considerable discussion about sales and marketing alignment. Interestingly, this very point shows up right here in our survey results—as a majority of respondents believe that a sales process should be created by sales and marketing together. Insight to this question is provided by top sales consultant and trainer David Hoffeld. Question 9: Where do most sales managers spend the majority of their time? The top answers to this question shows that a majority of sales managers are a bit “all over the map” in terms of where they spend their time. Some spend their time in a mixture of early and late sales process stages, while others in whichever stages they are needed. Noted sales thought leader Matt McDarby weighs in on this question. Question 10: Do you have documents, marketing assets or other materials specifically allocated to individual stages of your sales process? The majority of respondents obviously do understand the importance of collateral materials as part of individual sales process stages. 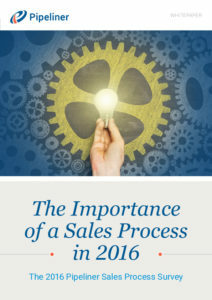 Most have specific materials aimed at some or all of the sales process stages. 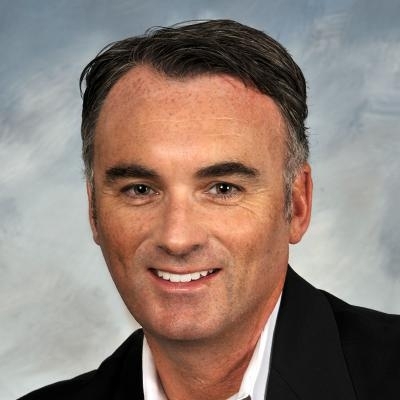 For an expert perspective, we turned to leading marketing consultant and author Joel Capperella.